One of the items on my crazed list of weekend activities was a course design clinic with Eric Hasbrouck. I fully admit that I was only in attendance for about half of it… by the time we closed up the shop and got some food, we got there a bit late, and then we cut out a little early to go watch the handy round of the derby. My notes are a little light, but it was still interesting. None of what he said was a major revelation to me, I’ve heard it before, but it’s definitely been a while since I’ve dedicated any real brain power to SJ course design, so it was a good reminder. In the beginning he spoke a lot about how it’s important to design courses appropriate for the people that are showing… like a Grand Prix the first week of WEF is going to be softer than a Grand Prix near the end of circuit. Or never put a 2 stride into a speed class or jumpoff for an under 1.10m jumper class, because without fail someone will try to leave a stride out and end up crashing. Or how, since he was new to the Texas crowd, he designed the courses a little bit friendlier the first week, like putting a more difficult question going toward the ingate, so he could feel it out a bit before ramping up the challenge. Looking at the course from the WEF week 1 GP. Quinn was not interested. Then he talked a bit about the jumps themselves and how the horse’s see them. Always pay attention to the background that the jump is going toward… poles that are the same color as the background are harder for the horse to see clearly. For example, the curtains lining the arena were blue, so the blue rails were going to be more difficult for the horse to see. For jumps with pillar standards, a pole that is set near the front of the pillar (as opposed to the middle of the pillar), is harder to jump clear. The pillar draws the horse’s eye in past the rail. On the same note, jumps that have a planks near the bottom draw the horses eye down. A liverpool that is set flush with or slightly behind the front rail will also draw the horse’s eye down past the rails, and is more difficult to jump clear than a liverpool that is set so that it’s edge is slightly in front of the rail. There was also some discussion about a movement that some riders are championing, trying to get open water jumps taken out of the sport. Eric is very against this and thinks that the open water is a staple, and should stay (I agree with him there). He said that instead, we should be working on introducing these jumps a lot sooner in a horse’s career, in smaller and easier-to-jump versions, so that they don’t end up 7yo and thrown into a class with a full size open water and be caught unprepared. He said that in Europe horses start seeing them a lot sooner in their competitive career, so by the time they get to the real GP with a real open water, it’s not a new concept to them. 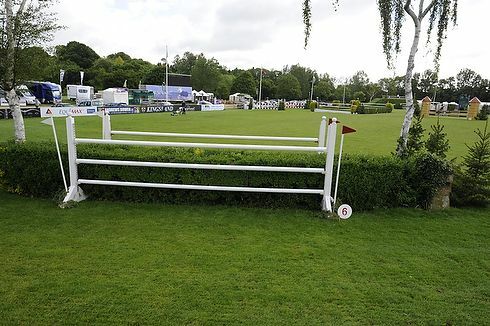 He was also a big proponent of keeping variety in the courses, and bringing back some of the more old-fashioned fences. He said that this year he used a hedge oxer at WEF, something that used to be very common but isn’t seen much anymore, and included walls as much as possible. He expected riders to be a little up in arms about the hedge oxer but actually got a lot of people that loved it, and enjoyed seeing something different in the ring. 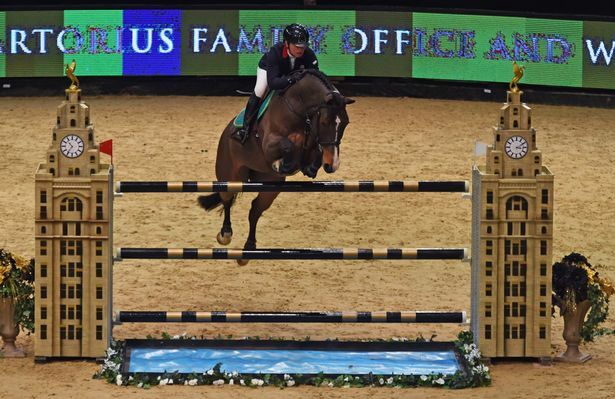 He is not a fan of how most of the courses look so cookie-cutter these days, and thought it was really important to preserve the types of fences and courses that you see at places like Spruce Meadows and Aachen and Hickstead. He also talked about the fact that time is much tighter than it used to be, and courses are wheeled on a higher speed. This is mostly due to the fact that everything is so much more competitive now, and the footing is so good that you CAN set these higher speeds without it being dangerous. BTW, he thinks it’s also very important for riders to know and understand how to think in METERS, including meters per minute for speed and what 350mpm vs 375mpm vs 400mpm feels like. Not just an eventer skill! I wish I could have stayed for the whole thing, Eric was interesting to listen to, and if nothing else he’s definitely re-ignited my brain as far as how closely I look at our showjumping courses to understand the questions the course designer is asking. You can bet that I’ll be looking at them with a bit more of an analytical eye! Yeah sure, a lot of it isn’t applicable to me (like… don’t have to worry about jumping open water) but even just as a spectator, knowing these things makes it a little more interesting. I know that this clinic was live-streamed but so far I haven’t been able to find a replay of it anywhere. If I do, I’ll come back and add the link. Love this kind of stuff. Thinking about these technical questions is what takes the jumpers from “me jump big go fast” to a really nuanced strategic exercise. I find this stuff really interesting and great to learn, no matter what type of jumping you do. Even as an itty-bitty hunter, how the jumps are set matter. I wonder how you would teach a horse that was used to dealing with cross country water how to jump a big open water like that? Like what if you wanted your horse to have both skills? I’d imagine that an eventer would probably just canter through a large open water on a show jump course unless you had some way of making sure they understood the difference. this stuff is fascinating and i love learning more about the little strategies that go into technical course design details. like all that stuff on how rail placement and orientation makes a difference in the way a horse reads the fence. so so so interesting, esp bc that type of thing often isn’t obvious or intuitive. Now I feel like my hatred of yellow fences is not unfounded. This is fascinating. I’d love to learn more about this behind the scenes sort of aspect of the competitive world. A lot more goes into it than I am aware of, I’m sure. How cool! I knew there was a lot of thinking and planning that went into course design but didn’t know all the details. I hope it gets posted online bc I’d love to watch it! I really like the bullet points about how they see the different obstacles. I knew about the planks and the liverpools, but was aware of the pillar standard visual. Interesting stuff. Also, I didn’t know people were trying to get rid of the open water. Sheesh! If that happens, pretty soon it will literally just be colorful rails all over the ring. I’m a huge weenie, but even I think they need to stop dummying everything down. 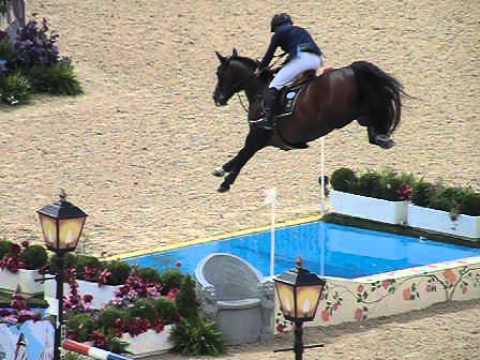 If you’re capable of jumping a grand prix course, you should be able to jump an open water.